This article is about the AC/DC song. For other songs with the same title, see Dog Eat Dog. 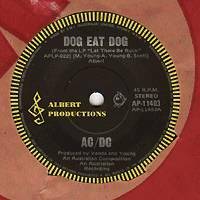 (1977) "Let There Be Rock"
"Dog Eat Dog" is a song by Australian hard rock band AC/DC. It is the second track of their album Let There Be Rock, released in 1977, and was written by Angus Young, Malcolm Young, and Bon Scott. It was released as a single in Australia, and included the non-album track "Carry Me Home" on the B-side, which was later released on Backtracks. AC/DC played "Dog Eat Dog" on their Black Ice World Tour until early 2010 when they dropped it from the set list and added "High Voltage".